Gary Caldwell, the Partick Thistle manager, expressed complete confidence in his team’s prospects of surviving a second successive relegation after drawing with the league leaders in Dingwall. The former Scotland international was in bullish mood despite Thistle slipping to the bottom of the Championship on the back of victories for Alloa and Falkirk. County, looking jaded after a hefty run of fixtures, toiled through the 90 minutes but did move six points clear of second-top Dundee United with three games to play. 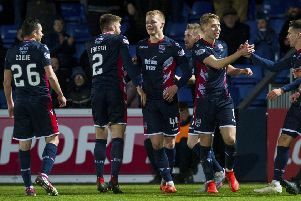 Given superior goal difference, the Staggies now need one more victory to be all but sure of the title. Caldwell, despite the fraught scenario of five teams within four points of each other at the foot of the table, insisted he hadn’t checked rivals’ scores after full time. “I thought we played really well,” Caldwell said. “We created three good opportunities in the first half and more in the second half. We just need to be a bit more clinical in the box and final third. “I didn’t know Falkirk and Alloa won. That’s the first I’ve heard. I said to the players we’ve got 12 points to play for and we focus on next week. “We know it’s a big game and, if we win every game, we stay in this league – it’s as simple as that. It was a first half that never really fully warmed up in the Dingwall sunshine. County remain a massive 31 points above the visitors, but you wouldn’t have guessed at the gulf in a poor first half. Partick’s Shea Gordon failed to connect properly in one glimpse of goal, while Scott McDonald’s weaving run brought another strike wide. Blair Spittal also produced a tremendous dash, dummying past three challenges, before cutting his attempt off-target. County frontman Ross Stewart’s saved 30-yard strike on half-time was the hosts’ first serious effort. Amid the second half battle of wills, there was a 68th minute penalty claim for County after Steven Anderson’s robust challenge on Ross Stewart in the penalty box had both tumbling to earth. Referee Gavin Duncan had a look but waved it away and then ticked off County co-manager Stuart Kettlewell for protestations. A Partick flourish late on saw Sean Kelly bring down Blair Spittal right on the far right edge of the box and defender Anderson hammer a powerful strike against Fox’s gloves for a terrific reaction save. County co-manager Steven Ferguson admitted: “We had to work for that point today, I’ll tell you. “We looked a wee bit fatigued and leggy and that’s understandable given the run of games we’ve had.